There’s no more significant time in the Jewish week than candle lighting on Friday evening. It’s been the mainstay of Jewish women for centuries. Traditionally, women would drop a coin in a pushka before ushering in the holy Shabbat. 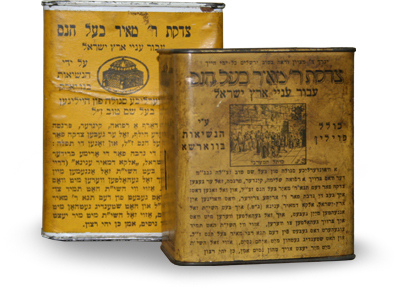 If you’re of Jewish descent, chances are that somewhere along the line, one of your maternal ancestors had a small tin Kupath Rabbi Meir pushka covered with yellow paper. She may have dropped in her weekly contribution with a whispered prayer, and dreams of reaching Jerusalem herself one day to see how her donations helped build the holy city. You too can reclaim the glory of this ancient tradition. We’ll send you a pushka along with the blessing to recite at candle lighting and a beautiful prayer in Hebrew and English. Your contribution will go directly to help the poor of Israel, and you’ll connect to our rich history in a deep and meaningful way. Order your free pushka and get a beautiful prayer card.